Going back to action – we suddenly had a race for P2 – as ‘JENSE serenely set off into the fading rays ‘O light as dusk fast approached. Yet Master ‘Zebb (Vettel) was suddenly being hoonded by The Krakow Kid, (Robert Kubica) as the BMW Sauber was clearly quicker upon its hard rubber (Prime tyres) vs. the German, whose Red Bull was squirming under the pressure upon its soft rubber. (Option tyres) As the two drivers promptly collided – ending both of their respective races in tears, albeit Vettel tried limping along on 3-wheels before ultimately being Black-flagged. As I’d thought that Vettel, who’d trailed ‘JENSE nearly the whole race, as the two drivers pulled out up to between a 19-27 second advantage, would wind-up in this order, albeit Kubica’s BMW-Sauber was closing fast, whilst ‘Rubino looked set to finish no better than fourth place. I’m sure that the Trulli Scrumptious was somewhat surprised to end up on the podium’s final step on his 200th Grand Prix start, eh? 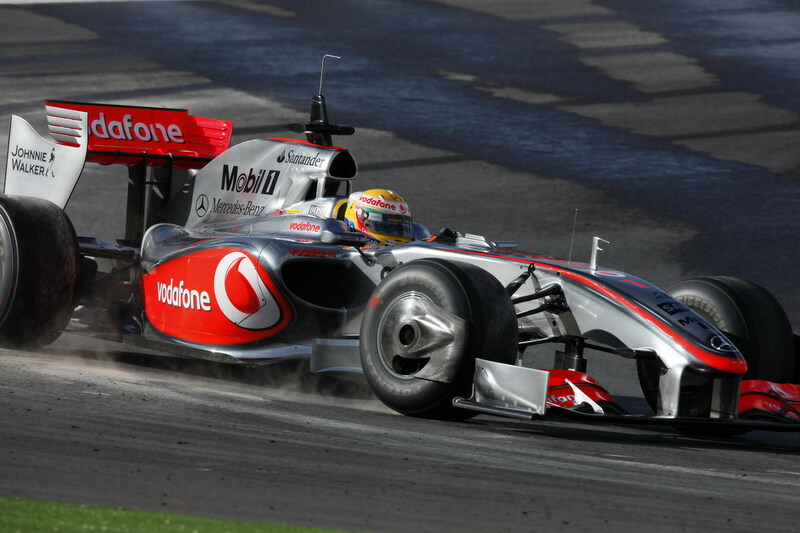 Especially after both Toyota’s had begun the race from Pitlane after having failed their technical rear wing inspection. And Lewis Hamilton had to be pleasantly surprised to have clawed his way up to fourth overall after having started P18 – his worst starting position to that moment. Hamilton dropped to 20th after the team was forced to change his Gearbox when the young Briton had chewed-up fourth gear in Qualifying, hence why ‘Louise never turned a lap in Q2. And thus Bahrain took Albert Park’s opening slot upon the Grand Prix calendar last year, albeit a very boring race over a supposedly new ‘N improved longer circuit – who’s new inboard section was so BUMPY that Hispania’s F1 debutant Karun “Cowboy” Chandhok spun off after hitting a bump he was unaware of before even completing 2-laps of the race. In Chandhok’s defense, the rookie Indian driver was definitely up against the dreaded 8-ball, as his car was completed so late, that I seem to recall that his first ever four flying laps came during the Saturday’s Q1 Qualie session; aye Karumba! Obviously when I made my plans to attend this year’s Australian GP, I had NO idea of the civil unrest that would sweep across Bahrain ‘N Beyond – and thus, I’m now partaking the 2011 season opener in Melbourne. And having missed my opportunity to witness the Grand Prix in Adelaide, with all of the current blatherin’ occurring over whether or not Melbourne can afford to continue hosting Uncle Bernaughty’s High Flying Troupes, nee Formula One – it’s definitely a good thingy that I’m going now while there’s still a race to witness, eh? So, who’ll win in Albert Park this year? As I suppose the Fans would go WONKY if Mark “Handlebarz” Webber could win it – which would be absolutely FANTASTIC for Mwah, although I suppose a betting man would wager his cash upon either Vettel, Hamilton or Alonso, eh? Now I’d better Bugger Off ‘N go find a cold Fosters; Cheers Mates!